Just as we anticipated earlier this month, T-Mobile’s first LG device, the LG Sentio, is available today, June 30. The Sentio offers a 3-inch touch screen with a virtual QWERTY keyboard, along with 3G connectivity and a 3 megapixel camera. 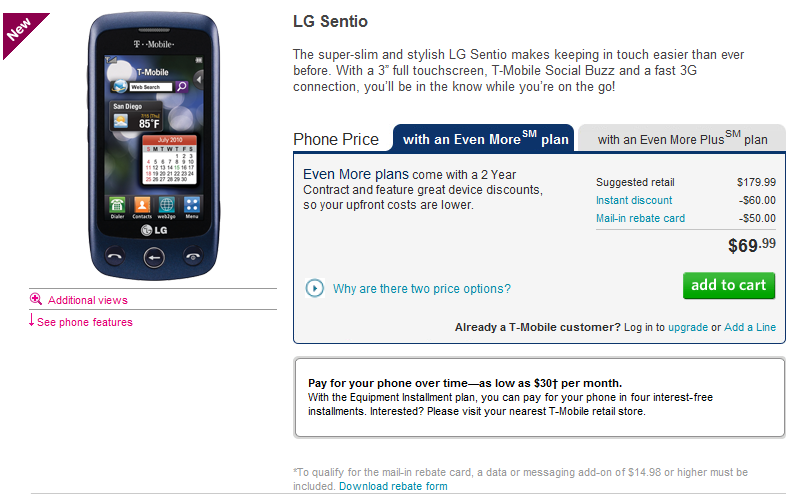 The LG Sentio will run you $69.99 with a 2 year contract (after rebate) and $179.99 sans contract. Do you know anything about Symbian 5th Edition? It is a smart phone OS, why would this LG be better? What Smartphone OS is on this LG, app support and navigation? The Nuron is able to add apps from the Ovi store and comes with a free navigation system. I’d go with the Nokia if I was looking for a phone in this price range. I would make a “what!?!??!! no FFC??? !” joke but thats old hat already too. Sweet…!!! Nah, I really don’t care. Hope it serves someone else good though. Where’s the Vibrant already!! I don’t much of the complaining transpires on this website. I love my Tmo service. I also don’t understand why the Moto Charm received so much hate and a phone like this, is skating home free without all of over dramatic post about leaving T-Mobile. I’m glad T-Mobile partnered with LG. Now maybe we can skip to the good stuff and get something like the LG Ally, or any LG Android device for that matter. Pretty cool little phone for the customer in this price range…. I’ll agree with that. Anyone that’s looking for a cool-looking phone yet basic, get this. I hear Verizon won the next iphone competition. Just another nail in TMO’s coffin! Let it go. Please, let the damn Iphone go. Nuron is much better than this just for the simple fact that I can get free offline turn by turn gps navigation and walk navigation for over 130 countries for life! It has a crappy name!! Did I cover most of it for everyone??? Hahahaha! Oh well I’m sure someone will enjoy this phone. Looks like a good starter phone for a teenager wanting a touchscreen or just someone who’s just starting out with their first touchscreen phone. This thing works with Web2Go. If the browser and touchscreen work well, this may be very successful. Got this phone a week ago and it’s great. It’s got the attributes that matter most to me – it’s inexpensive to purchase ($20) and has a cheap monthly data plan ($10), it’s small and light, solid construction, the call quality is good, the battery lasts 3 days w/o recharging, texting is easy and it can get to the web for the occasional peak at the news, emails or directons… I don’t need a $200 phone that can play Avatar in HD and cost me $360 a year in data plan charges … but everyone has different needs! just because the nuron haz navigation means nothin.thats one thing. forget it dang! !